This week we honor everybody's favorite otter with Crios Event! Fish, exchange items, or whip up some alchemy for some awesome treasures! We are also adding a week long challenge to award those who have achieved Lv.60 before 08/1/18! Get those EXP scrolls ready, and pop those bells because the race is on! Take to the seas and beef up your Frigate’s crew with the new Sailor Contracts! Finally, hunters can take arms and head to Kamasylvia because new monsters have been spotted. Get those matchlocks primed and ready to fire! We have plenty more in store you so continue on to the rest of the patch notes. ◈ Crio’s Favor event has been added. • During the event, Fish, Exchange, and Perform Simple Alchemy to obtain Sealed Golden Treasure Chest! • Click <Here	> for the details on this event! • Challenge (Y) for reaching Lv.60 has been added. • During the event period, a new Challenge to reach Lv.60 has been added via Challenges tab (Y). (Once per Family allowed). • Adventurers who have achieved Lv.60 with their characters before the maintenance will have the Challenge completed automatically upon logging-in. 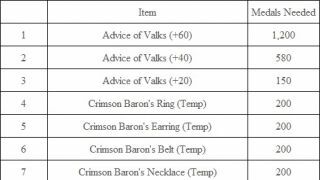 • Trina Knights First Captain’s Support Kit (7 Days) will require at max 34 Inventory Slots free in order to obtain all components inside. ◈ WARS REVAMPED! 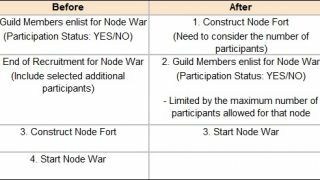 (New Conquest/Node War event): July 22nd After Node War ~ August 5th Before Conquest War. 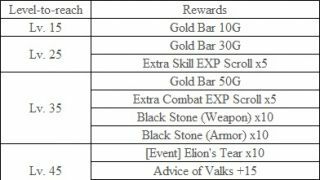 (Please keep in mind all rewards for Wars Revamped event will be given out after the event ends). ◈ Mysteries of Summer has ended. ◈ Terrmian Waterpark has ended. • With this update, a special in-game housing item ‘A birthday present from the Black Spirit’ will be given out on the birthday anniversary of your Family creation. • The birthday cake item will be sent out via in-game mailbox (B) every anniversary. • For any Family created before July 25th, 2017, their anniversary birthday cake will have already been sent out during this week’s maintenance. • For any Family created on and after July 26th, 2017, their anniversary birthday cake will be sent out on July 26th, 2018 and forward (1 year after the Family creation). • Click < Here > to find out more! ◈ Sailor Contract from before has been renamed as Sailboat Sailor Contract. ◈ Frigate Sailor Contract that can be equipped on Epheria Frigate has been added. 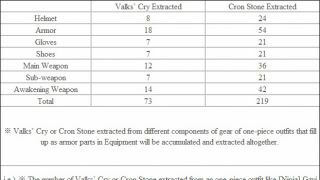 • Now you can hire 4 different types of Epheria Boatmen from the Amity Shop of Calpheon Worker Manager NPC. 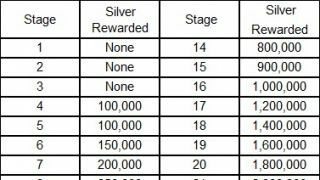 • You need to have at least 500 Amity points to access the Amity Shop with the relevant NPC and upon purchase of the contract, Amity Points will decrease by 500. • Depending on the type of the Boatman, a specific ability of the frigate will increase. ◈ Frigate Contract Renewal: Professional Boatman has been added to the Amity Shop of NPC Tirol in Dias Farm of Calpheon. • As with Sailboat Contract Renewals, right-click the Frigate Contract Renewal to open up the UI to renew the contract. 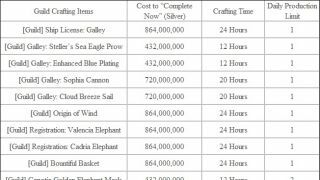 • The contract renewal will extend the contracted period by 24 hours, and the Boatmen contracts can be renewed up to 7 times. ◈ New quests to obtain Skilled or Professional Frigate Boatmen from Philaberto Falasi of Port Epheria has been added. • ‘Skilled’ quest: The quest can be obtained from Philaberto Falasi with Amity over 1,000. This can be done with a character of Skilled 1 and above in Sailing who possesses a normal Frigate Boatman contract. 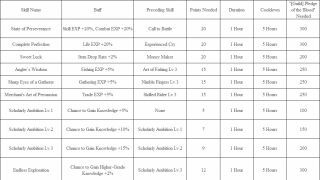 • ‘Professional’ quest: The quest can be obtained from Philaberto Falasi with Amity over 1,000. This can be done with a character of Professional 1 and above in Sailing who possesses a Skilled Frigate Boatman contract. ◈ Fixed the issue where the game screen would turn purple intermittently. ◈ A new function to give an alarm message if there is a locked item when exchanging items with NPCs has been added. ◈ Additional improvements have been made regarding the issues where an empty screen would be displayed upon opening up web UI in-game. ◈ Fixed the issue where cancelling multiple item exchange with an NPC by pressing Cancel (ESC) button on the calculator UI during Exchange did not work and the Exchange was processed. ◈ In order to prevent possible system function failures, the game client window can now only be resized when your character is on standby. ◈ Fixed the issue where resizing game client window while performing Concealment and Dash skills would allow irregular actions. 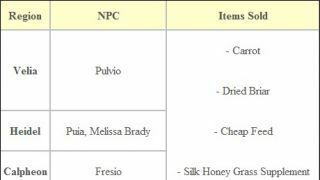 ◈ NPC located near Keplan Quarry Node Manager Phirea has been relocated to acquire more space between the NPCs. ◈ Fixed the issue where NPC Muis didn’t return to his spot when the quest Goblin with Pearl Oyster was forfeited. ◈ Fixed the issue where using Sprint while Forest Path Wagon that was moving in auto-navigate would stop it intermittently. ◈ Fixed the graphical issue where the hair would go outside the helmet or disappear when putting on Garnier Troupe Garb and Giath’s Helmet together with a female class. ◈ Fixed the graphical glitch that occurred when the following classes wore Queen Heart Underwear and Marine Romance Outfit together. ◈ Fixed the issue where the characters’ outfit would look unnatural upon unequipping swimsuit while having on certain items on the Main Weapon slot in Equipment. 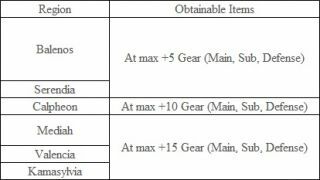 • It has been changed so that any items other than Main Weapon and Fishing Rod would not be equippable while setting underwear/swimsuit. ◈ Fixed the issue where the skill effects would look different for the caster and the spectator upon using the skill Heavy Strike. 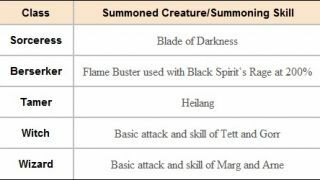 ◈ A skill effect has been added to the skill Charging Slash. 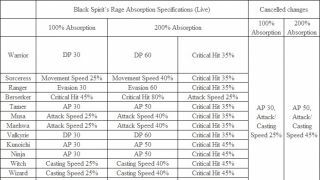 ◈ Fixed the issue where the skill Frenzied Destroyer could not be used intermittently when the skill was performed continuously while moving left or right. 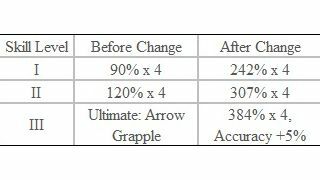 ◈ Fixed the issue where CC skill effect would be applied even in PvP during Charge state when using the skill Giant Leap I, II, III to the rear. ◈ Fixed the issue where detailed customizing of character could not be done when choosing the 1st hairstyle in character customization. ◈ The blood effect that was displayed while using the skill Fireball has been removed. ◈ Fixed the issue where the outfit would look awkward when wearing Epheria Marine outfit with certain underwear together. ◈ Fixed the graphical glitch that occurred when Mystic wore the Marine Romance Outfit and Zebra Underwear together. ◈ A Cheer motion effect has been added when opening Kzarka, Nouver, Kutum, and Dandelion box items. 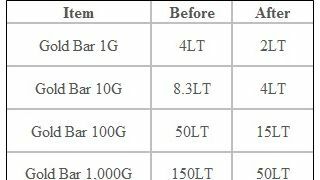 ◈ Fixed the issue where Oil for Lantern could not be purchased by the General Goods Vendor. 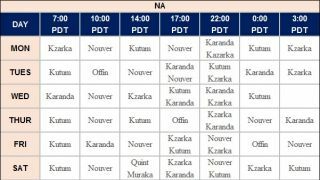 ◈ Boss Time Schedule update! 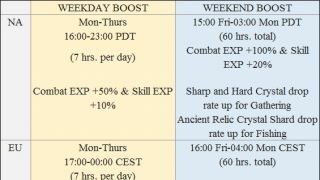 • Please click < Here > to see the latest updates on the World Boss spawn schedule. 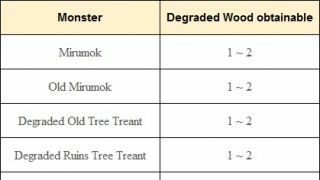 ◈ New monsters for Hunting have been added to areas of Kamasylvia. • Ganelles of Kamasylvia have deep affection for animals and nature, but they advocate Hunting in general. Every time the monsters above are Hunted, your Karma will decrease by 5. ◈ Fixed the overlapping issue of the name and HP of Cox Prison. ◈ Daily Hunting Quest related to <Wild	> Ferrica and <Wild	> Ferrina have been added. • The quest can be obtained from NPC Jasmine, the Blacksmith at Acher Guard Post, with a character of Lv. 58 and above and with Professional 1 or above in Hunting. 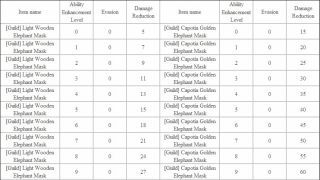 ◈ Daily Hunting Quest related to <Wild	> Belladona Elephant has been added. • The quest can be obtained from Acher Guard of Acher Guard Post with a character of Lv. 58 and above, with Professional 1 or above in Hunting. ◈ Daily Hunting Quests related to <Wild	> Gazelle and <Wild	> Black Leopard have been added. • The quests can be obtained from NPC Aniki with a character of Lv. 58 and above, with Professional 1 or above in Hunting. • However, if you cannot have a conversation with Aniki, you cannot accept the quests and in this case, you need to proceed with the main quests of Kamasylvia Part 2 first. 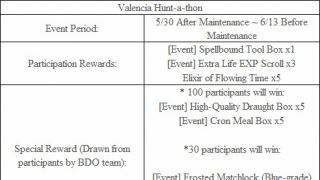 ◈ Daily Hunting Quest related to <Wild	> Feather Wolf and <Wild	> Phnyl have been added. • The quest can be obtained from NPC Lucielle Monet with a character of Lv. 58 and above, with Professional 1 or above in Hunting. ◈ A “Show Stacked HP Bar” function has been added. This will help you see the amount of HP another adventurer has more easily. • You can toggle the function in Settings	>General Settings	>General	>Show/Hide. • Your character’s HP bar will not appear stacked to you. • When you use this function, you will see HP bars in the colors of the rainbow. 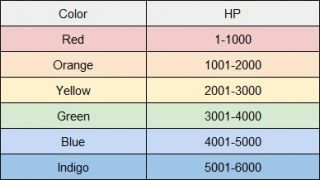 The colors will correspond to the HP an adventurer has, and it will change every 1000 HP. 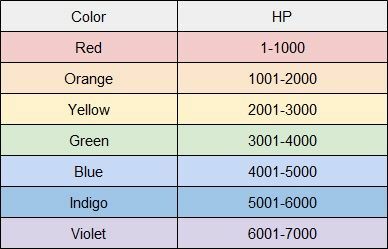 • If the HP is over 7000, the color cycle will loop back to red. ◈ It has been changed so that Highest-spec mode for game settings can be selected from Graphics menu. ◈ Fixed the issue where pressing all 3 filtering buttons on top right corner of the Inventory (I) would cause duplicate sounds. ◈ Fixed the overlapping issue of text and the ‘Learned Only’ button in Cooking Utensil/ Alchemy Tool inside Residences. ◈ Fixed the issue where abnormal message would be displayed upon using normal or Awakened Giath Summon Scroll. 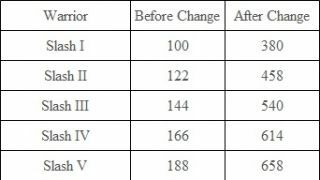 ◈ It has been changed so that stats from Fairy skill ‘Feathery Steps’ would be applied in the Weight Limit Exceeded UI. ◈ Fixed the issue where Fever Time event icon would not be displayed in the upper section of the game window where buff icons are displayed. ◈ The display of the following icons in the old ESC menu has changed. • The NEW notifications on Quick Hotkey, Item Drop, and Setting Archive have been removed. ◈ The display of the following icons in the new ESC menu has changed. 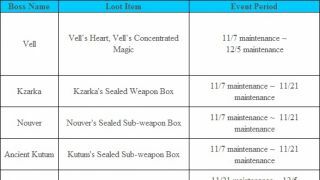 • HOT notifications have been added to Savage Rift, Team Battle, Quick Hotkey, Item Drop, Imperial Auction House, and BDO TV icons. • The NEW notifications of Social Action and Notepad have been removed. ◈ Fixed the issue where error message was being displayed even when application to Global Lab testing was successfully made. ◈ Fixed the abnormal path that the liner at Ancado Inner Harbor followed. ◈ Fixed the issue where items with weights that were not in whole numbers (e.g. 2.5 LT) were not registered correctly by the Naphart Campsite. 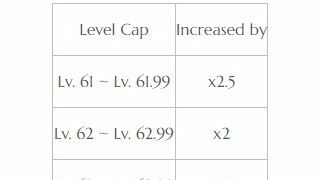 I disagree with the lvl.60 temporary soft cap gear. It feels like they're testing the water before they permanently add a monthly pearl shop package or something for soft cap gear. They wouldn't just us all this gear randomly for no reason. Patch Notes - 22nd August 2018 : Remaster for Black Desert Online is here! [NA/EU] Patch Notes - 6th June 2018 -Lahn’s awakening weapon, have been added. [NA/EU] Patch Notes - 23rd May 2018 - Lahn Release!